WASHINGTON (October 1) -- Mike McCurry gave his last daily briefing Thursday, winding up his four-year tour as presidential press secretary. But the affable McCurry leaves behind a lingering mystery: How can a man who denies, obfuscates and beats up on reporters be so popular with the White House press corps? "Mr. Knoller of CBS News ... had a close encounter with a rat, here in the press briefing room. I know the feeling," McCurry once quipped. "I'm not playing this game today," McCurry snapped. "Claire, I'm just not going to parse the statement for you," McCurry dismissed. He could be all three at once. "My next move is to get off this podium as quick as possible," McCurry said, provoking laughter from a press core determined to get answers and information but sympathetic to the position of a sympathetic man. And he was an in-your-face critic of sloppy journalism. "You know, I know, you're all going to have to run out and yak and yak and yak forever about this, but it's going to be based on very few facts," McCurry lectured. But still he remains one of the most popular White House press secretaries in recent history. "Reporters perceived Mike McCurry as a good and a decent person, first of all, and that counts for a lot. He has never, at least that we know of, lied to us, that counts for a lot," explained NBC's John Palmer. McCurry has been the public face of the White House spin machine, the first spokesman to allow his daily briefings to be televised. He's bobbed and weaved his way through plenty of scandals. But when the Monica Lewinsky story broke, McCurry proudly proclaimed himself to be "out of the loop." He couldn't respond to questions about President Clinton and the intern -- in fact, he didn't want to know the answers. That's in part because McCurry once worked for former New Jersey Sen. Harrison Williams, who wound up being convicted in an FBI sting called Abscam. McCurry had to testify before the grand jury. He did not want to make the same mistake with Clinton. 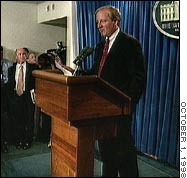 After succeeding Dee Dee Myers at the famous podium, McCurry tried to be an ambassador between a president, who disdained the press, and reporters, who didn't much trust the president. And he livened up an otherwise dreary pressroom. In one of the moments for which he will be long remembered, McCurry showed up in the White House briefing room with a large brown-paper bag over his head, proclaiming,"I'm briefing today as an anonymous source."  Is California ready for a Democrat as governor?